Bank of Scotland has today unveils its newly-designed £10 polymer note which will come into circulation in the autumn. It retains the portrait of the Scottish novelist and poet, Sir Walter Scott on the front alongside the image of The Mound, the historic head office of the Bank of Scotland. 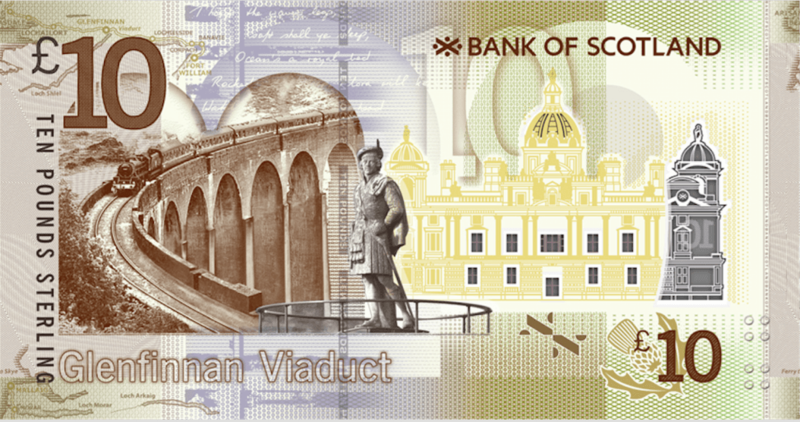 All of Bank of Scotland’s notes carry a portrait of Scott, who was a prominent figure in the campaign for Scottish Banks to retain their right to print their own banknotes in 1826. The Glenfinnan Viaduct remains on reverse of the new note, but now features a steam locomotive hauling a heritage tourist train. 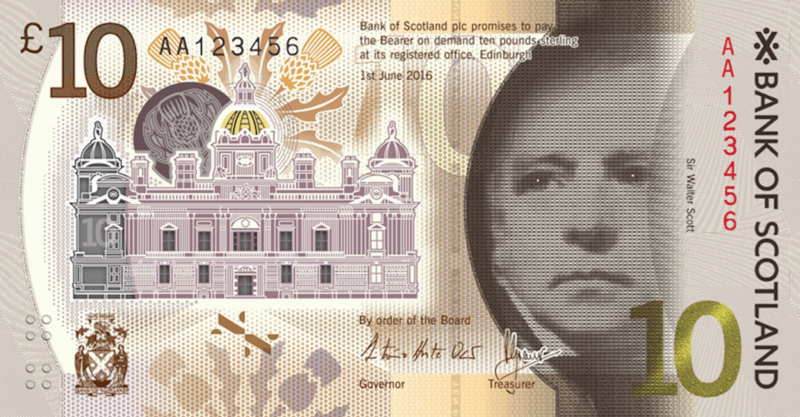 The polymer note, designed by the banknote manufacturer, De La Rue, incorporates the enhanced security features introduced on the polymer £5 note, including the anti-counterfeit “window effect” which will be built into the windows of the image of The Mound, and the “rolling bar” metallic ink which changes colour as the note is moved. It will also include a new “tactile emboss” – created by a series of raised dots – which will aid the visually impaired. 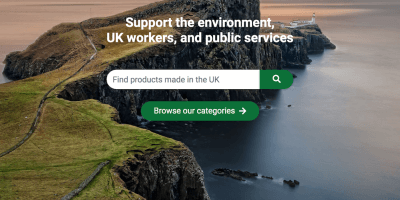 Mike Moran, Director at Bank of Scotland, said: “Bank of Scotland has been issuing bank notes for more than 320 years, evolving our designs to pay homage to our heritage. The locomotive pictured at the head of the train on the new £10 note is a preserved Stanier ‘Black 5’, which was designed for the London, Midland and Scottish railway and often seen on the West Highland line. A popular locomotive during the steam era, 18 examples have subsequently been preserved and often operate special trips across the UK, including the line from Fort William to Mallaig.